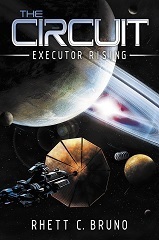 The Circuit: Executor Rising, is a fresh new book, one that I quite enjoyed. It is partially post-apocalyptic, partly a space opera shoot-'em-up, but it works well together. The story follows Talon, an ex-muscle for a bigwig, now reduced to working the mines where is contracts a fatal condition, Cassius, a former Tribune, and Sage, an Executor, a modified assassin/fighter/spy working for the Mew Earth Tribunal. Cassius has plans to fix the wrongs he perceives in the system, Talon is a Cersian, a group downtrodden by the Tribune, a group Sage is sent to infiltrate. The greatest strength in this book is the characterization of the main figures. There three protagonists are not good nor bad, but a combination of the both. I still don't really know if Cassius is a "good guy," and Sage certainly has some, well, very negative characteristics. Even Talon, who is generally a good guy, has his bad side. This makes all three fascinating as each successive chapter reveals just a little more about what makes them tick. Overall, the world-building is good with quite a bit of detail. There are not too many gaps: it is a fully developed, complete environment. The book is not perfect, though. There were some errors of science and logic. I am not sure why people have to drink a synthetic alcohol, for example, because real alcohol is too expensive. Prisoners make booze in their toilets, and prehistoric man managed to make it, so any group of people in almost any environment should be able to gin up some alcohol. There were mistakes made concerning the effects of vacuum. A minor issue is actually one of my pet peeves in books and film: artificial arms, no matter how advanced, cannot do as they are described here. A person with an artificial arm, for example, simply kneeling with the artificial hand resting on the floor will not crack the flooring. These are minor points, though, that do not really make a big difference in the fast-paced, exciting storyline. AMID, Cassius' super-android, might be just too all-powerful for my taste, but the author still managed to make me care about him. I have my own thoughts on how he might develop, but I guess I will have to wait for the next book to see if I am right. The point is that I want to see what happens, so that is a pretty good indication that I've been hooked. This is a good book and a good start to a series. I plan on reading more, so I have to recommend it as a good read. For more reviews or to buy The Circuit from Amazon.com, click here.